great stage presence, not only when he sang but even when he stood back to let the other players do their thing. 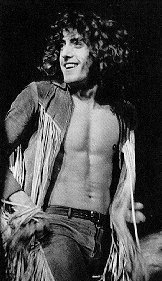 Roger Daltrey was born in Shepards Bush, a tougher part of London than where John and Pete grew up. Roger learned how to survive with his fists, becoming somewhat of a thug in his early teen years. But Roger also learned how to be strong, how to take control, how to lead, and how to survive. It was his confident attitude that led the group in their early years as The Detours. However, it was the natural born leader inside him that caused many of the conflicts between himself and the rest of the group. Shortly before the band released "My Generation," Roger was fired due to a conflict between him and the rest of the band. Of course, the song soared to #2 in the U.K. charts and he was taken back. It was with Pete that Roger had the most fights. Pete was the principal song writer and creative force behind The Who, but Roger, the quintessential front man, sang most of the songs. This led to a vieing for leadership within the band, a constant battle that took it's toll on all of the members. After The Who disbanded, Roger released a few mildly commercially successful solo albums, but his largest interest (in the entertainment field anyway) has been acting. 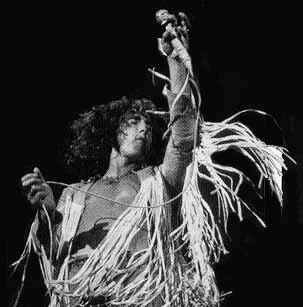 After being bitten by the acting bug playing Tommy in the film version of The Who's most popular rock opera, Daltrey went on to try his hand at a number of movies, and a few television shows (including HBO's "Tales From The Crypt" and the poular "Highlander" series, in which he has appeared on several occasions).